Cutting the 25th-anniversary cake are, from left, Vaughan councillor Gino Rosati, Noble GM Jim Anderson, deputy mayor Mario Ferri and councillor Sunder Singh. 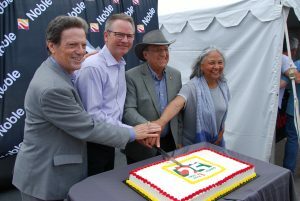 Ontario based wholesaler Noble celebrated its 25th anniversary with a packed barbecue on June 22. Over 1,200 people attended the event at the company’s 920,000 sq. ft. head office and warehouse in Vaughan, Ont. In addition to food, drink, speeches and numerous vendor displays, visitors had a chance to meet Toronto Maple Leaf legend, Doug Gilmour. He happily signed autographs and posed for pictures, with a lineup that didn’t seem to diminish all evening. As the evening wrapped up, Noble officials presented a cheque for $30,000 to the George Brown College Foundation to support scholarships for trade students. For more information, please visit www.noble.ca.